Chinese New Year isn’t even here and yet we’re already talking about Valentine’s Day?! Given that these two special occasions are so close to each other, it would definitely be wise to plan ahead — book a restaurant, choose an outfit, get a gift, and not forgetting, a lovely floral bouquet for your special one this Valentine’s Day. Don’t be fooled into thinking that flowers are useless and won’t last forever! Some of the bouquets in this list use dried flowers and preserved flowers, so they won’t fade as quickly as fresh flowers do. Moreover, some of these florists are having promotions now, so don’t miss out on this opportunity to save some bucks! Many girls are huge fans of baby’s breath, especially tinted ones. 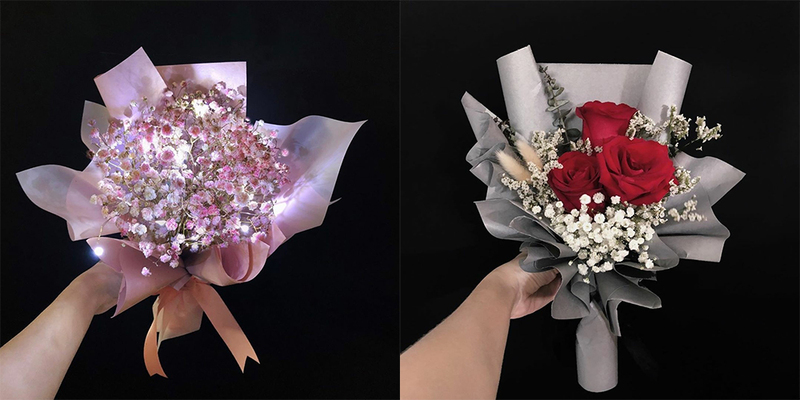 Surprise your girl with a bouquet of pink baby’s breath coupled with fairy lights, perfect for a princess. You can also choose to get other bouquets like the one on the right that features traditional red roses. Charm her with this gorgeous bouquet on the left that features red roses, the epitome of love and romance. Show your adoration for her with the J’adore bouquet featuring roses accompanied by matthiolas and wild foliage. 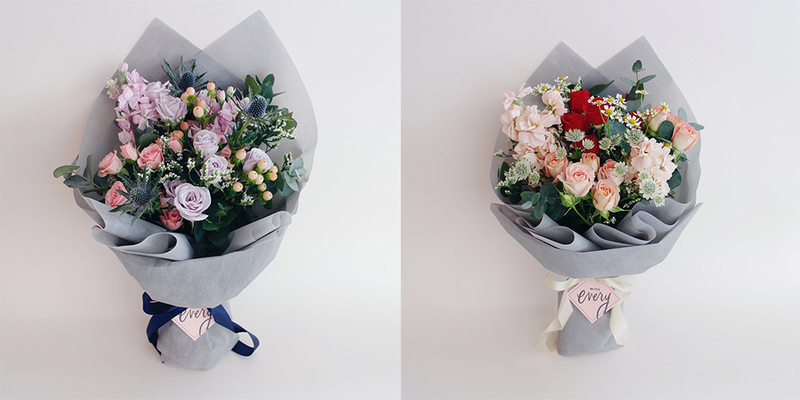 As its name suggests, the bouquet on the left symbolises everlasting love. It uses preserved roses and can generally last for a year with care. Remind her of your love with this everlasting bouquet. 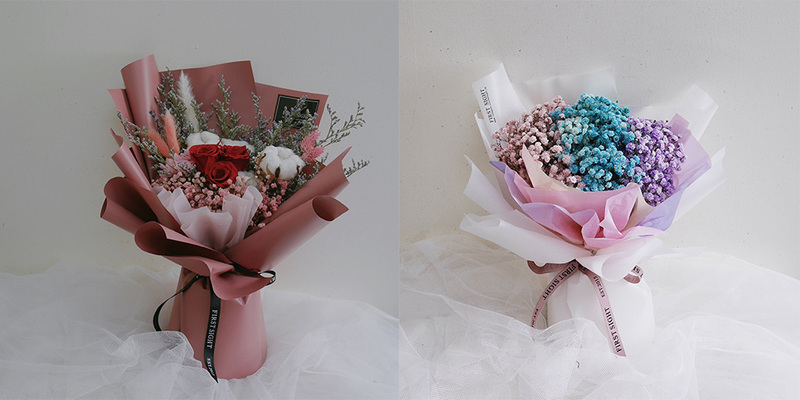 Alternatively, for the fun-loving girl, get the bouquet on the right that has a sweet mixture of pink, blue and purple baby’s breath. 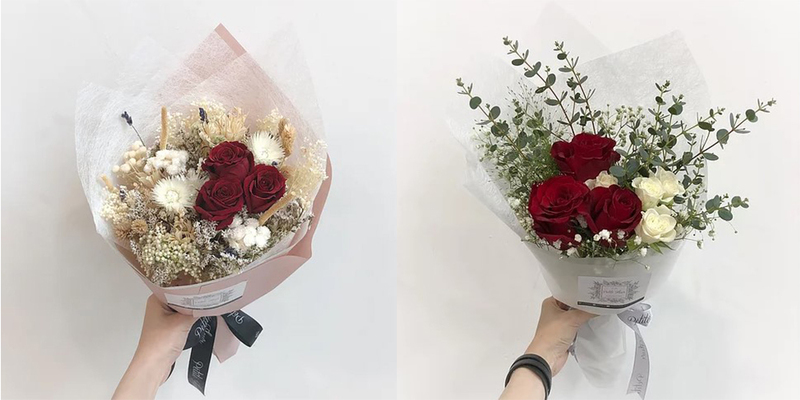 The everlasting bouquet on the left uses preserved roses that last forever as well as dried flowers all the way from Italy for a love that never fades. The bouquet on the right features three roses which means “I love you”, a classic that can never go wrong. You can opt for fresh blooms, but any practical girl would care more for preserved ones instead — especially if she’s into the more rustic aesthetic. If three roses means “I love you”, then three preserved roses means “I love you forever”. Get an everlasting bouquet (that lasts more than a year) to convey your unwavering love for her. 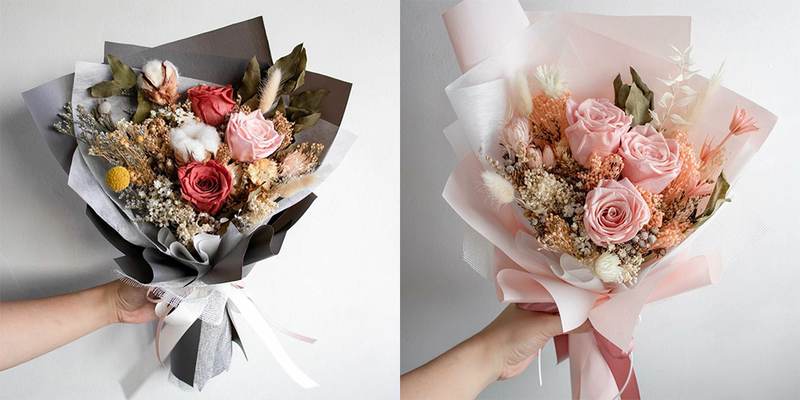 The bouquet on the left uses cotton flowers, adding a soft, fluffy touch to this creation. This is great for girls who adore cute stuff! 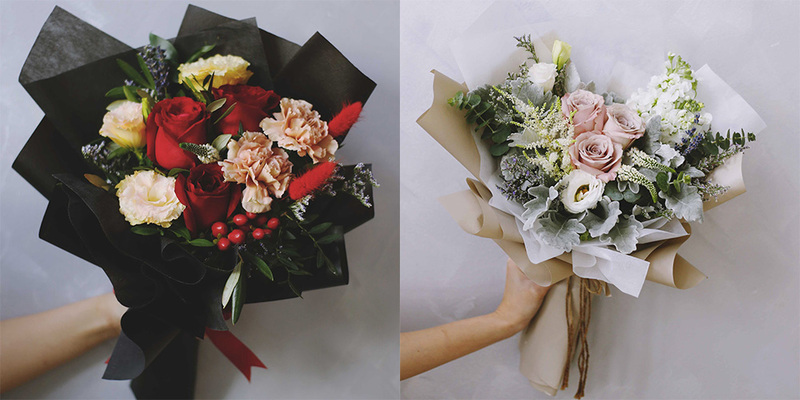 The dried flower bouquet on the right is a perfect everlasting gift for her. 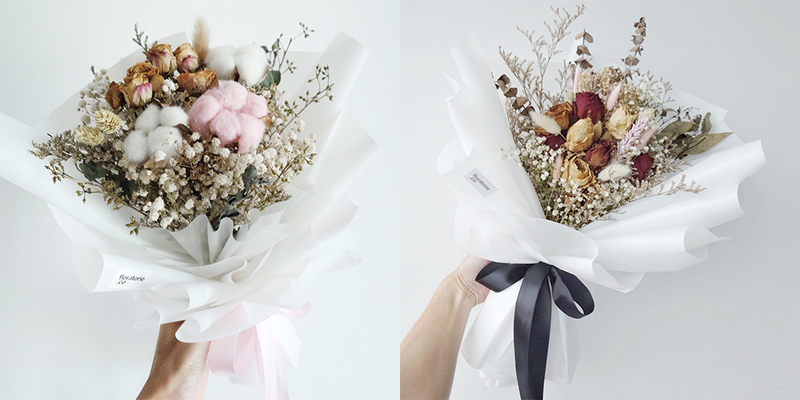 These bouquets are inspired by With Bloom Room’s love for bubble tea. The bouquet on the right uses a mix of lilac rose sprays, bubblegum rose sprays, blue erygiums, champagne berries, candy matthiolas, wildflowers and eucalyptus foliage. The bouquet on the left features roses, daisies, coral matthiolas, and a pop of berry “bubbles” with eucalyptus foliage.